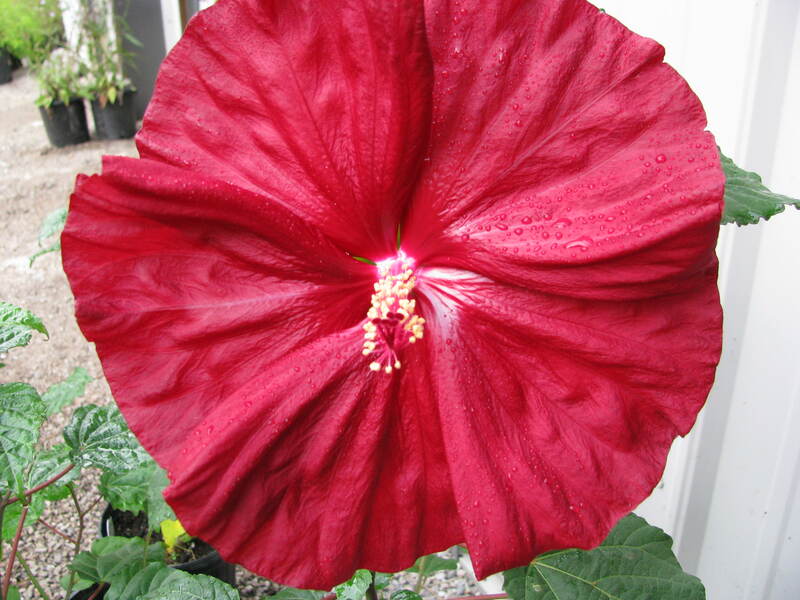 It’s hard to believe – a tropical-looking hibiscus with plate-size flowers is hardy for Midwest gardens! In fact, the showy flowers are now in bloom in area gardens. Heartland Gardening recently talked with Linda Johnson, co-owner of Scioto Gardens (a must-visit nursery and specialty plant supplier in Delaware, Ohio) about these crowd pleasers. She recommends this group of perennials for great, mid- to late-summer WOW! She says the super-sized flowers come in a range of colors from pure white to pink to bright red. Plus, they’re deer resistant and tolerate wet soils. 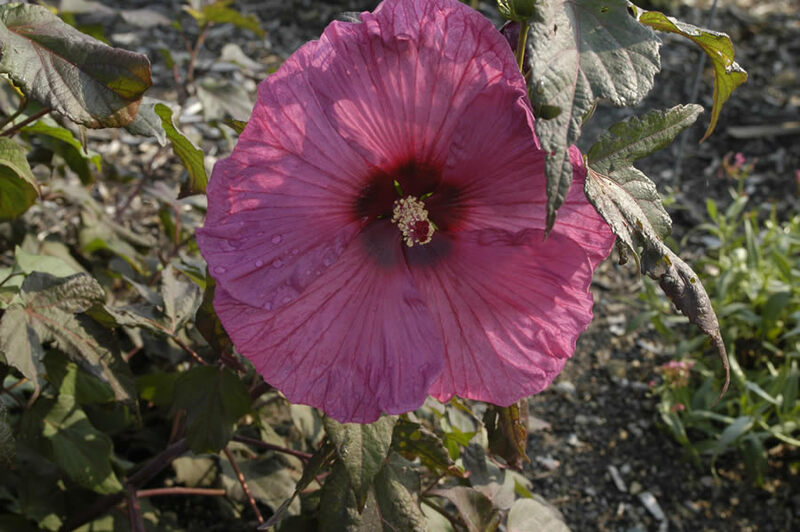 Even though some Hibiscus are tropical, there are many cultivars that are cold hardy in the Midwest. Two species are even native to Ohio. 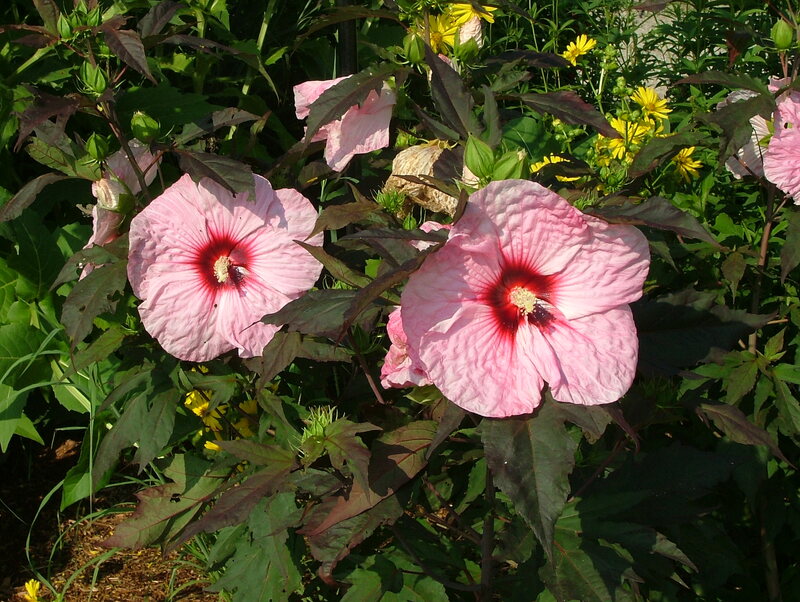 ‘Robert Fleming’ is a dwarf Hibiscus getting only three feet tall. 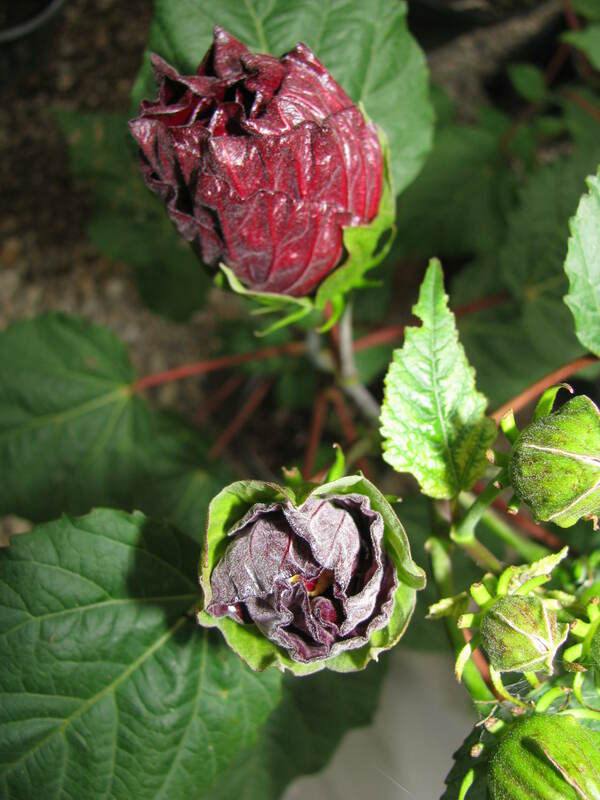 The buds emerge dark purple and then open into a deep, rich red. Known for its striking flower, this cultivar is named after one of the Fleming Brothers who were famous for their hybridizing of Hibiscus plants. ‘Kopper King’ has coppery-colored foliage that’s quite attractive throughout the season. The flowers are light pink with a dark pink center. The plants grow three to four feet. ‘Plum Crazy’ Flowers are rose-purple with darker purple veining and a very dark purple central eye. Foliage is deeply dissected, purplish green and the plants grow about three to four feet. Hibiscus moscheutos is one of the species native to Ohio. It usually has flowers that are white with a dark pink center, but sometimes the flowers are pink. The flowers are conical and a bit smaller than the wide-open dinner plate flowers of the cultivars. It is typically found in marshy areas. The plants can grow three- to six-feet tall, depending on moisture and soil fertility. Today’s gardeners are getting more efficient when it comes to gardening in tight quarters. Whether they’re city dwellers planting a garden on a balcony or empty nesters tending a small patio garden, these gardeners are finding savvy solutions for their limited real estate. Go dwarf – Growers are introducing many space-saving perennials and shrubs. Check out the dwarf conifers and hydrangeas and miniature hostas. Even edible plants are now available in pint-sized versions. Try BrazelBerry dwarf berry bushes, columnar fruit trees, espaliered (grown vertically along a trellis) trees and grafted tomato plants. Grow up–Chose upright and vining plants to take advantage of vertical space. 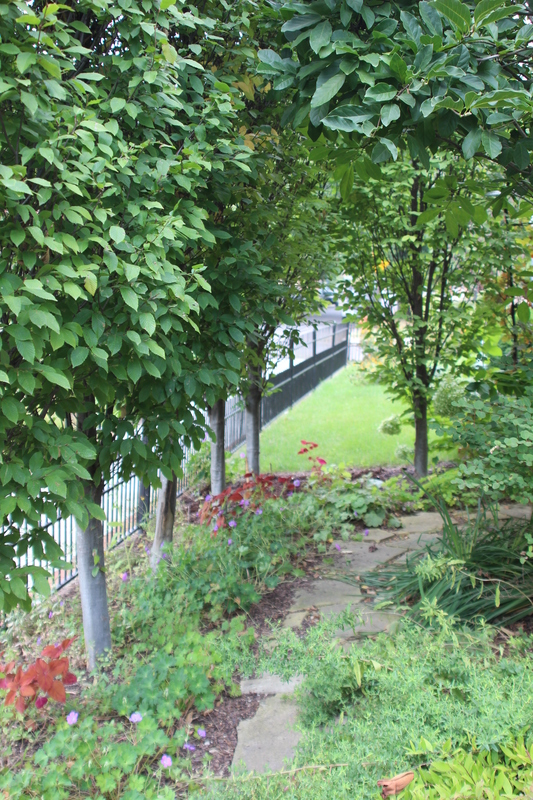 Columnar hornbeams create a narrow privacy screen along a walkway. 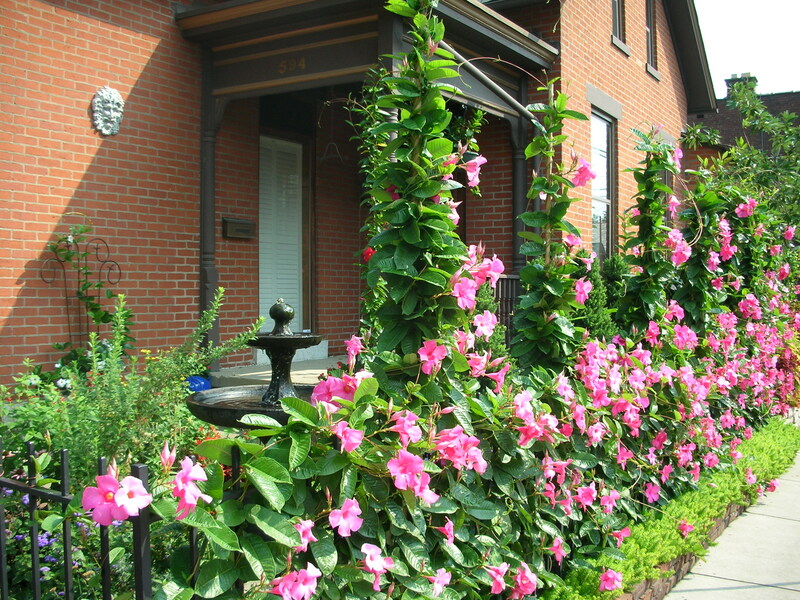 Flowering vines like clematis, hydrangea and honeysuckle climb trellises, patio walls and fences. Repeat details – Details count in not-so-big spaces. Invest in quality stone or ceramic containers or architectural features like window boxes or an eye-catching arbor. Create illusions — Mirrors can be added to garage windows and garden walls to bring more light to shaded areas and reflect the space to increase its apparent size. 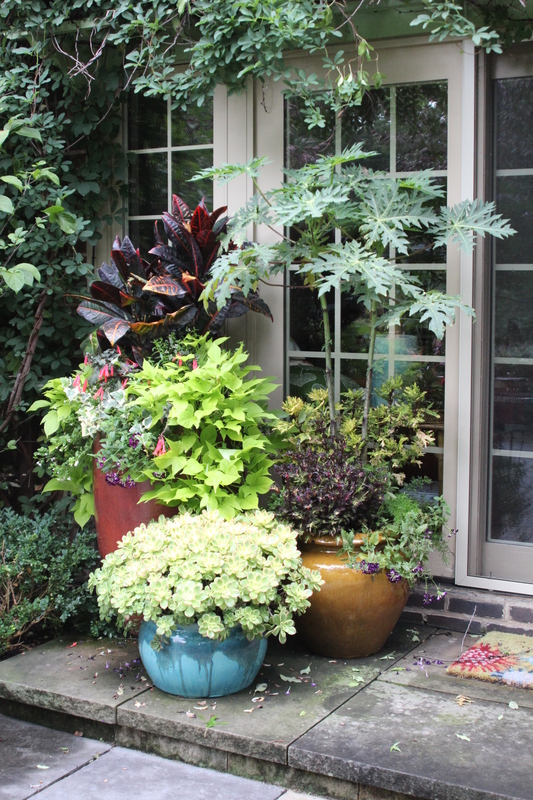 Cluster containers – Maximize patio space with clusters of container gardens. Even vegetables, dwarf trees and shrubs can be grown in containers. Autumn is the time of golden, scarlet, and maroon leaves and shortened days. It is the time for picking apples and harvesting vegetables. We watch our gardens slowly decline, and yet there is one perennial that says “Wait, my time is now!” Enter the asters, the late summer to fall-blooming plants so loved by bees and butterflies. We often overlook the flowers of autumn as we fill out our gardens with spring and summer blooms. Many of us buy plants in April, May and June when the spring and summer flowering plants proudly show their colors. But we overlook the asters which are just emerging: green leaves and no flowers. 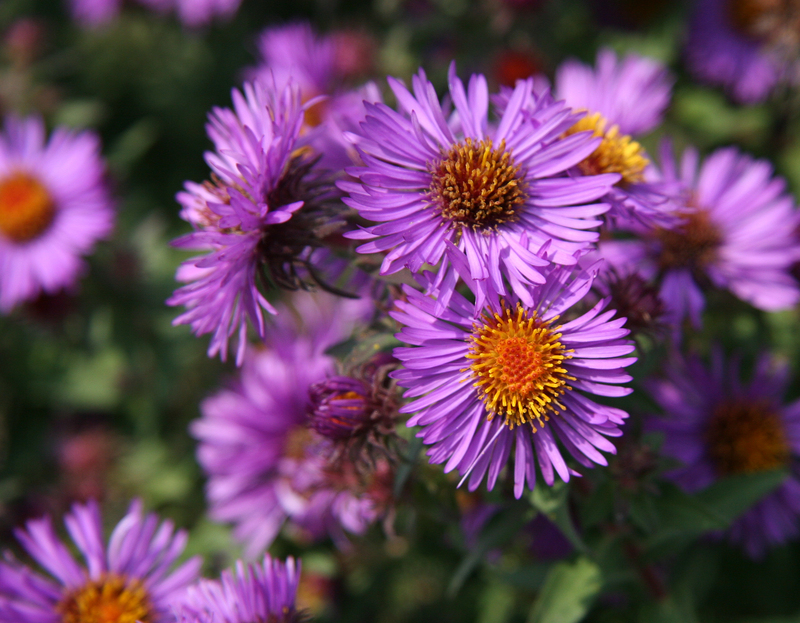 Asters prefer full sun, 6+ hours of light; most tolerate part sun, four to five hours of light. 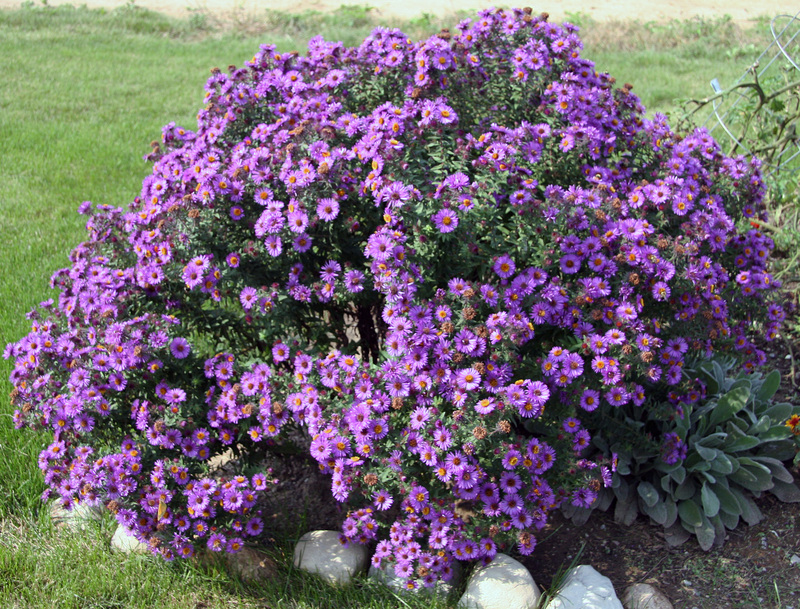 Most asters are drought-tolerant if you keep the soil moist during the first year in the garden. Asters love compost, but excessive fertilization will cause them to grow quickly and ungainly; an aster lying on the ground is not attractive! The taller asters should be cut back by 1/3 in early to mid-June to promote stronger stems and to avoid the need for staking. Asters are best divided in the spring. It’s not too late to add these late bloomers to your garden, but don’t wait too long. After late August, asters may not have enough time to grow their roots into the soil and acclimate to your garden before winter arrives. If you miss the planting window this year, buy the green, leafy aster next spring. Here are some species that are native to most of the Midwest. Many of the cultivars listed have been selected for their compact habits and richly colored flowers. Not only do our native asters suffer because they lack early flowers, but they have been separated into new genera with difficult names. One of my horticulturist friends calls it the “aster disaster”. If a garden center has arranged the perennials by their botanical names, the asters will be spread across several locations on the nursery shelves. Fortunately, in most garden centers, asters still hold a place at the beginning of the alphabet instead of being scattered throughout the benches. For those who are interested the new botanical names are listed with the common names. Robb’s euphorbia (Euphorbia amygdaloides var. robbiae) is an evergreen groundcover. Barrenwort (Epimedium hybrid) in May. The leaves are subtly edged in red. Dry Shade – words that strike fear in amateur as well as seasoned gardeners. Some gardeners camouflage these areas with nicely fluffed, dark-colored mulch. Others opt for the dry stream bed “look” which is achieved by spreading river stone of various sizes in an artful, river-like pattern. Even though dry shade is a challenging site, it can be enhanced by using good garden practices that work in any garden situation. It all comes down to amending the soil, choosing your plants wisely and watering them to get them established in their first year. 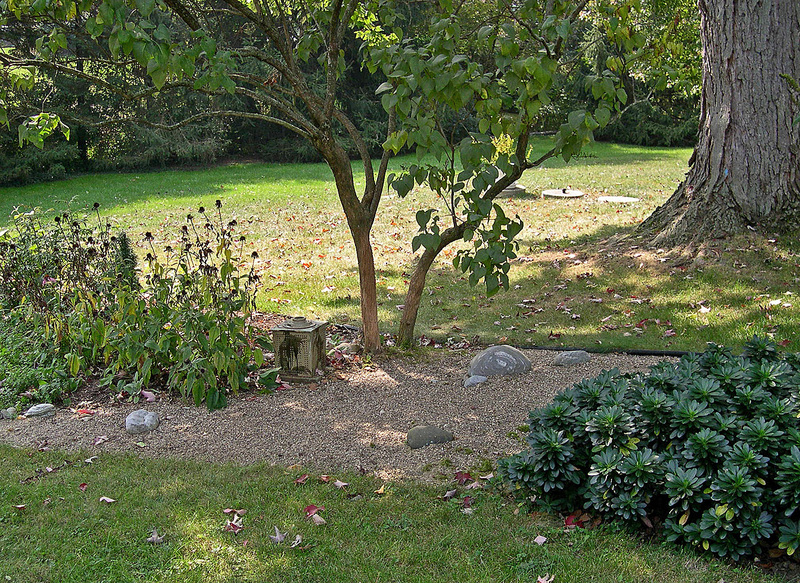 A dry streambed in Debra’s garden with Allegheny spurge on the right. Notice the large silver maple trunk in the upper right. Tree roots are much more efficient at taking up water and nutrients than shrubs and perennials. You’ve heard it before: amend the soil. This means incorporating organic matter in the form of leaf, mushroom or homemade compost into the existing soil. In open garden areas, you can till in organic matter without a thought to damaging existing roots. Under trees, a different technique is needed. As you plant, amend the pockets of soil that are between the roots and then cover the whole area with two to three inches of compost or hardwood mulch. Crested iris (Iris) – native plant; slow spreader, but very cute! A note on “establishing” your plants in their first year in your garden: A garden rule is that newly planted gardens should receive about one inch of water per week. A rain gauge can help keep track of the rain amounts in your yard. If Mother Nature sends less rain, get out your garden hose. Water your garden in the early morning as you drink your coffee or tea. And, it is better to water two to three times a week, deeply, rather than every day with a light sprinkle. This summer’s been a busy one for Heartland Gardening bloggers. Congratulations to Debra — named the honorary president of the Herb Society of America for 2014-16! She just returned from the Perennial Plant Symposium in Cincinnati where she saw a lot of new perennials and brought a new perennial sage home to plant in the garden. This month, Michael and Teresa have been hawking the 2014 Parade of Homes with articles in the BIA Planbook and Columbus Monthly Home & Gardens. This year’s tour in Delaware County was an impressive one with several million-dollar homes. The three bloggers also participated in the Cultivate 2014, a leading horticulture industry trade show at the Greater Columbus Convention Center. 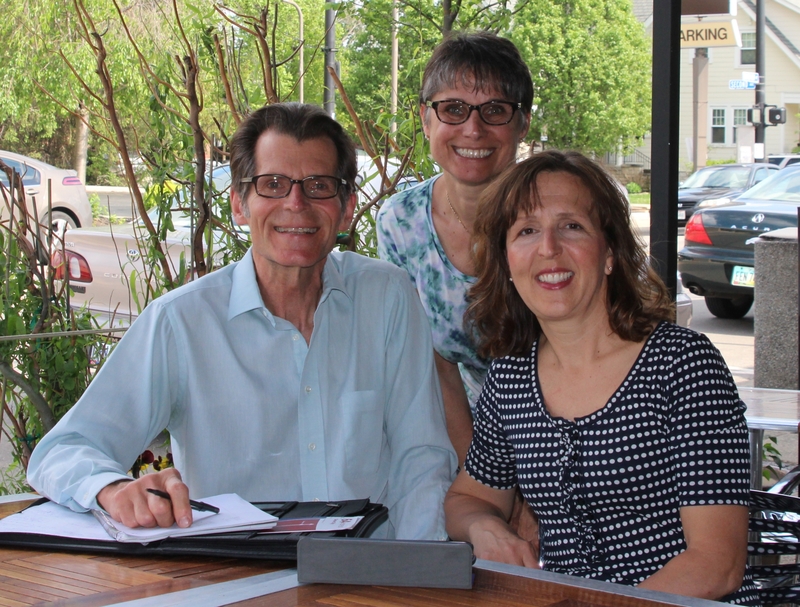 The trio attended insider sessions and scouted the trade show for gardening ideas to share here. Michael and Debra represented Garden Writers Association (GWA) on the trade show floor, and Teresa served on a social media panel with other GWA members. The bloggers also are busy in their backyards trialing new plants, products and techniques to share with readers. Teresa’s delighted to achieve success in growing heirloom tomatoes and find her heirloom Kiss Me Over the Garden Gate has self-sown from last year’s purchased plant. Debra has been entranced with the blooms of two day lilies from Walter’s Gardens: ‘Midnight Raider’ and ‘Mighty Chestnut’. ‘Lava Lamp’ Heuchera has been a winner, too, with its dusky burgundy leaves. With her latest lavender – ‘Platinum Blonde’ – a trial from Creek Hill Nursery, she can now say she has three beautiful “blondes” in the garden. Michael’s enjoying “the generally cool, moist (sometimes soggy) weather pattern that has persisted since May, instead of the typical dry to drought we normally have.” He’s thankful lawns are April green and flowers are lingering for weeks. “Is this my part of the Midwest or a dream?,” he says. In the August issue of Country Living published by electric cooperatives in Ohio and West Virginia, Michael has an article focusing on how hospitals are using healing gardens to help patients. Teresa’s been producing magazine stories for 2015. Check out her latest stories in the current issues of Country Gardens (“50 years and Counting”), Ohio Gardener (“Annual Attraction”) and Columbus Monthly Home & Garden (“Within the Garden Walls”). Finally, our blog is being featured this summer in the Columbus Dispatch Real Estate section (print and online versions). Check out recent posts on dry shade gardening and fall veggies. If you want fresh vegetables for Thanksgiving and perhaps New Year’s Day, start planting. Don’t forget, growing your own food is trendy. Cold weather harvests will keep you stylishly ahead of the mere zucchini growers on the block. Besides being nutritious, the bodacious foliage of kale, collards and chard play well with asters, mums and other fall flowers. ‘Bright Lights’ Swiss chard even sports colorful stems. * Look at seed packets for the maturity date (time from sowing to harvest) and subtract from the first frost date, usually about mid-October in central Ohio. The longer the time to maturity, the sooner you need to sow for best chances of success. You may want to add a week or two to that maturity date to allow for slower growth due to lower temps and shorter days. * Don’t worry about frosts or even some freezing for cold-tolerant kale, collards and Brussels sprouts. The flavor improves after a few frosts. * Check garden centers for small broccoli, cauliflower and cabbage plants. Direct sowing seeds of these plants probably won’t beat the clock. * Prep the soil before planting. 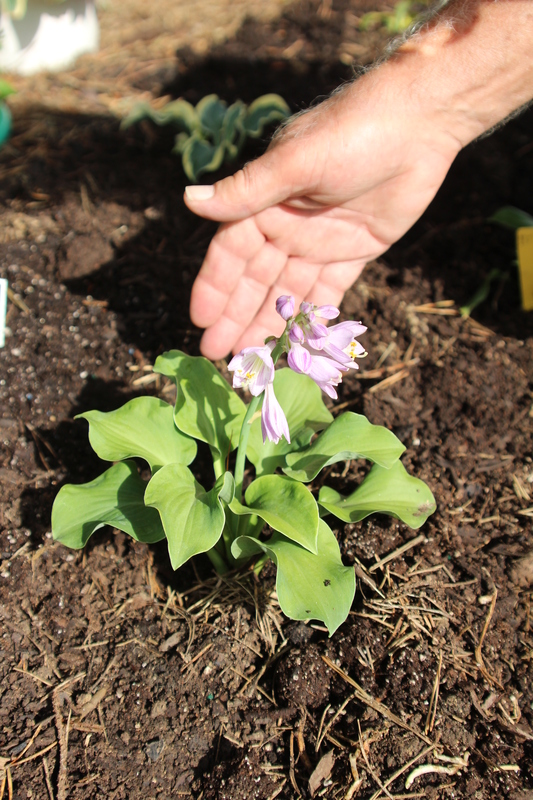 Spread an inch or two of compost or other organic amendments. Scatter organic or other fertilizer at package-given rates. Till all this into the top two or three inches of soil. * Use floating row cover after sowing seeds. This lightweight agricultural fabric keeps bugs off plants, yet it’s so lightweight, seedlings easily push it up as they grow. I leave it on all winter for wind protection. Despite the infamous polar vortex, I harvested a few greens for bragging rights on St. Patrick’s Day. In mild winters, some greens can be picked almost every week. * Plant only what you like to eat and enough to meet your family’s needs. If there is excess, donate it to the Mid-Ohio Food Bank or a local soup kitchen.